Blowout Sale! Up to 53% off on Topical Anesthetics at Dental Training for Missions. Top brands include PROLINE, CENTRIX, Unknown, Cargus, Sultan, 3D Dental, Iolite, Septodont, 3D, & Crosstex. Hurry! Limited time offers. Offers valid only while supplies last. 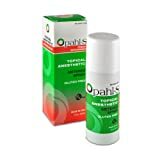 Opahl-S 06-00060 20% Benzocaine Metered Spray Topical Anesthetic, Fresh Spearmint Flavor, Can x 2 fl. oz.